A most colorful event took place in Southside Park today . 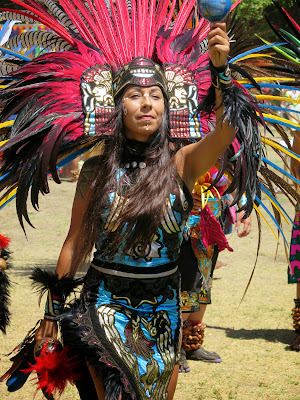 The Xilonen (pronounced she-lon-un) or Aztec Dance Festival made it's 40th annual appearance in the city. Xilonen is a coming of age festival for young girls to honor Xilonen, the goddess of maize. The ancient Aztec festival draws performers from across the US and Mexico. The ceremonial costumes were unbelievably beautiful and colorful. The entire performance was sensory overload. I arrived before the parade and dance began and was able to talk with some of the dancers and watch them prepare for the event. One of the cool things is that the dancers are very proud of their costumes and more than happy to pose for pictures.